we use Icinga and its integrations in many different ways, and we love to hear more about it in your Icinga Camp/Meetup talks. Since we as the people behind Icinga also know that not everyone can do so, we’d like to start a challenge on here. Include everything you think is worth sharing, by replying to this topic. Here’s a few pointers on what’s the basics you can add. Be creative, the list isn’t complete nor mandatory. What criteria did you weigh up in deciding to engage Icinga? How do you add new monitoring objects? Describe your configuration workflow roughly. How do you integrate Icinga with your other Tools? What’s that ONE piece your missing in Icinga? Is there anything else you would like to share? Don’t hesitate, add everything you think is interesting! Share your Icinga Environment! 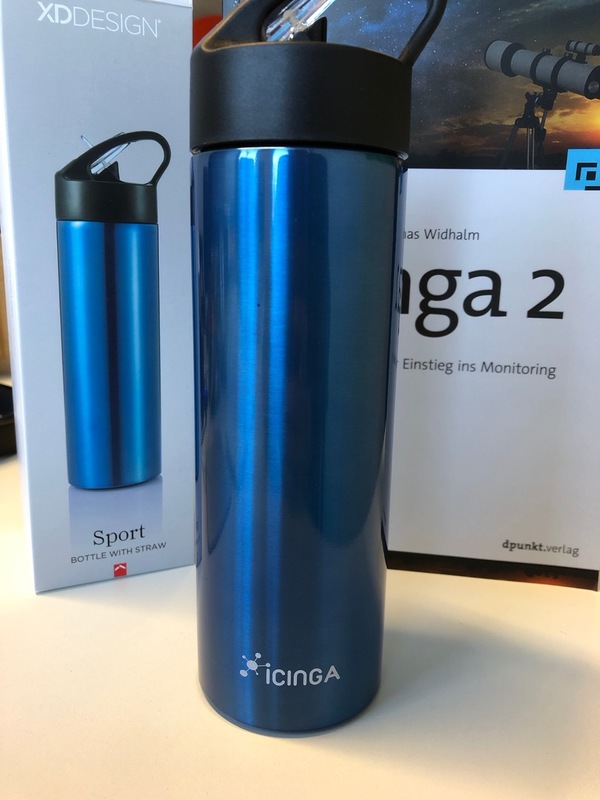 Reward for the first 3 Icinga users taking part: One fancy blue Icinga drink bottle and a free ticket to Icinga Camp Berlin! Take your time with collecting all the details and screenshots, but as always - add them as as soon as possible. To give everyone the chance to step in, like and share, the first round targets the end of March, 2019. Since people seem shy to post their Icinga setup, I will to post our small environment and inspire others to do the same. First of all, we are a publicly funded institution, so our budget is tight. We tried both NewRelic and Datadog, which are fine in what they do but are too pricy for us plus we had some GDPR related issues. 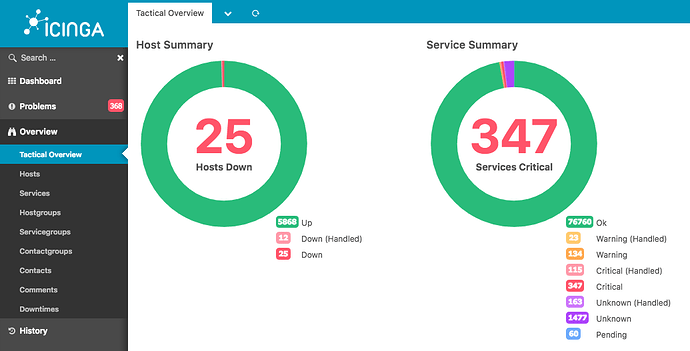 Some in the team had previous experience with Nagios and OP5, but we opted for Icinga because we wanted to pair it with our Graylog servers and have an overview of what is happening in our systems plus the interface seemed good enough. Our environment is small, 124 servers and 1010 services are monitored. We have no need for HA and Satellites for the moment, so a single VM with Icinga and two containers with Grafana and influxDB. We gather most information through network plugins and SSH for load, memory, etc for Linux servers and WMI for windows servers. We don’t use Director either. We wanted to keep it as simple as possible and went with plaintext files. We manage them with a combination of ansible playbooks mostly for adding/removing new servers and some manual work for adjusting services and variables. Favourite icinga module is the Grafana module by Carsten Kobke. We love Grafana and praise Carsten daily for the plugin. As for integrations, we use the graylog plugin to check our Graylog streams and we have written a custom plugin to integrate with Statuscake which checks our services externally. Previously it was also reporting issues to HipChat, but since we moved to Slack we stopped sending messages there due limits in the free version. We are also using dashing interface in a big screen, so we know quite fast when things break. We would really like to have a proper reporting functionality for all sorts of cases but for the IT team a better way to handle notifications (maybe NoMa2 ?) is our number one request now. Finally, a big thank you to all who have worked hard to make Icinga a great project, a top-level monitoring tool and fantastic community. I just found out this, and I’d like to share our “not so small” platform. We reviewed several monitoring tools a while ago and we decided to migrate from OpenNMS (our old platform) to Icinga because of the integration with other tools and the ease (but powerful) of configuration on Icinga. As you can see on the screenshot, we’ve got ~5900 hosts in total and ~79k services. Sadly for us, it’s not all green. At the moment, we don’t use Director, so our configuration is done directly on the files. Since there is a big group of people working on the configuration, we manage it through our SCM and pull requests to avoid issues. Like @gkoutsog, I would say that Grafana module is the favourite for us. At the moment, we’d like to have a configurable reporting tool that allows us to get metrics and maybe some graph reports. I’m new on the community forum, so I’ll be checking the documentation and sharing my experience with all of you. 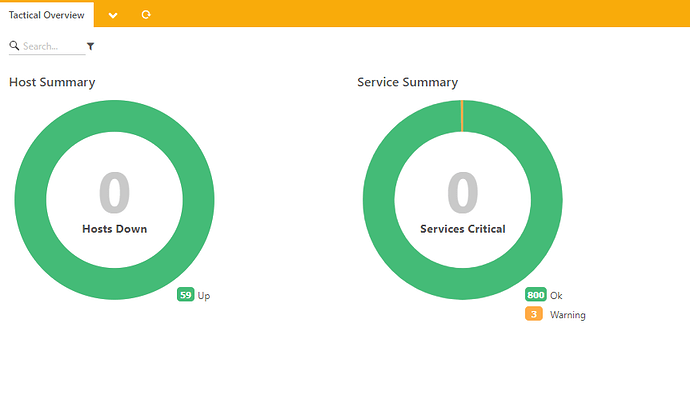 We monitor 59 hosts and 803 services. information/cli: Finished validating the configuration file(s). The master is running on a HPE ProLiant DL380 Gen7 with InfluxDB and Grafana. Checks are done though the icinga agent, ssh and snmp. Also using some own check plugins written in perl, python and C#. The configuration is done though .conf files - for version controlling we are using git (gitlab). In addition to the standard mail notifications we get also notifications though sms for cirtical hosts/services. Using a simple umts stick, with a sim-card and the gammu package for sending. New monitoring objects get at the moment added manually. We are planning to do this automated via chef for installing/configuring icinga2 agents. For our employees we made a little system status page, so they can have a look if something isn’t working. Data gets requested via API. At our office we have two monitors to know whats happening in our infrastructure - the first one displays an icinga2 dashboard and the second one grafana dashboards with a playlist. Like the others said, the grafana module is also the favorite for us. Thanks to @Carsten! Using also the x509 module for certs handling, thanks for that. A build-in reporting tool would be nice, i already read that something is in progress - looking ahead to use it in the near future. Thanks for reading and a big thanks to all who made icinga a great, maybe even the best monitoring tool - we love it! including DC’s, Exchange, Backup, Antivir and other infrastrucutre servers/services. so a really bug thx to the team from netways which is “Head of Developlent” for the Icinga Features/Modules. U guys/ and girls as well do a realy good Job. I followed the icinga2 development from the early days of the beta, when there was no icingaweb2. After switching companies, the new deparment had many issues related to none existent or spotty monitoring, so the first thing I was tasked with was to fix all the problems which included setting up a monitoring system. Naturally I decided to use Icinga2 as it seemed the most powerful and accessible tool with a nice community. Our setup is rather small, but it only encompasses our department of 14 people, nonetheless we have currently around 59 VMs that are dedicated to our department, which all need to be controlled and monitored. Adding hosts is done automatically, when they are setup. We run ansible playbooks to fully configure our hosts, so it was a natural decision to also add them to icinga via a playbook, this is realised via a python script that talks to the director REST-API and adds them with configuration values for hostgroups, processes to survey etc. We have the need to modify Objects, without engaging the director. So I teamed up with @bodsch to port his API from ruby to python. you can find the API here: GitHub Repo it is currently rather stale, as I do not need any more functions. This is a hard one, as I really like the director and the grafana module and can’t decided which one has brought me more joy. We have hybrid cloud landscape which is combination of AWS Cloud & On Prem Infrastructure . As SRE our focus is to ensure 100% availability of all the OS |App | DB | Network| Middleware services. We had face lot of challenges in past due to gap in monitoring coverage. Main agenda behind implementing ICINGA is to ensure 100% monitoring coverage using continuous monitoring. 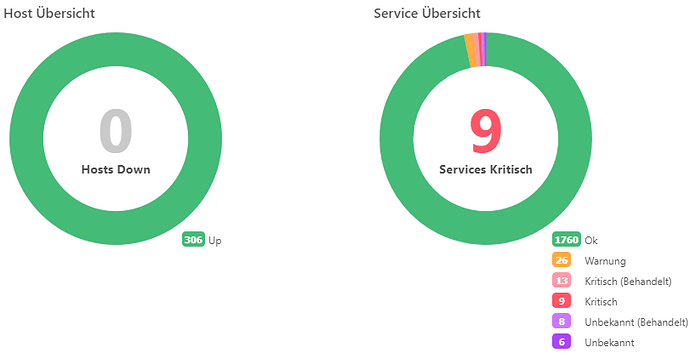 Currently our entire infrastructure is getting monitored from ICINGA which consist of ~1300 servers & ~24000 services . 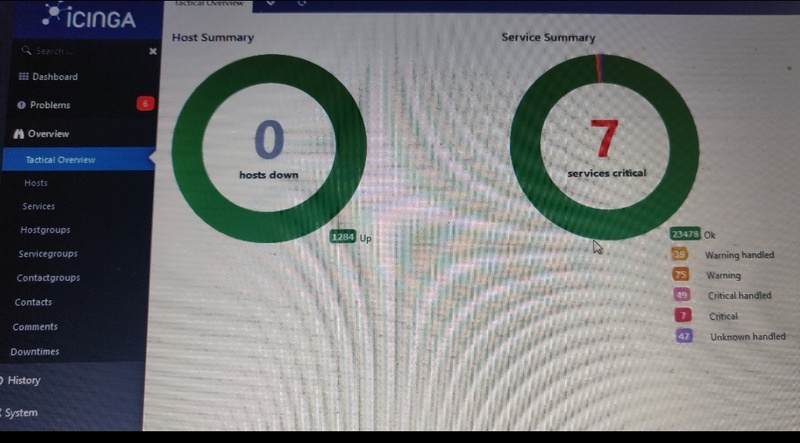 ICINGA master is in High availability which is connecting to 08 satellites. We are looking forward to see out of box reporting capabilities from ICINGA . This is our primary monitoring tool & most of our incidents are getting captured proactively. About three years ago we started evaluating on how to replace our existing monitoring setup (icinga1 (+centreon as config ui), that we used for us and our customers. We had some 3-4 different solution with which we (tried to) built a testing environment. Icinga2 made the race because of the rewritten code and not being a nagios fork anymore. Also it was easy to set up, offered a modern looking interface (with many integrated modules), a out-of-the-box distributed/HA-option and (for us) the biggest selling point was the announcement of the Icinga Director. [2019-03-12 08:30:56 +0100] information/cli: Loading configuration file(s). [2019-03-12 08:30:56 +0100] information/ConfigItem: Committing config item(s). [2019-03-12 08:30:58 +0100] information/ConfigItem: Instantiated 1822 Services. [2019-03-12 08:30:58 +0100] information/ConfigItem: Instantiated 1 IcingaApplication. [2019-03-12 08:30:58 +0100] information/ConfigItem: Instantiated 306 Hosts. [2019-03-12 08:30:58 +0100] information/ConfigItem: Instantiated 1 FileLogger. [2019-03-12 08:30:58 +0100] information/ConfigItem: Instantiated 195 Dependencies. [2019-03-12 08:30:58 +0100] information/ConfigItem: Instantiated 15 NotificationCommands. [2019-03-12 08:30:58 +0100] information/ConfigItem: Instantiated 2412 Notifications. [2019-03-12 08:30:58 +0100] information/ConfigItem: Instantiated 1 NotificationComponent. [2019-03-12 08:30:58 +0100] information/ConfigItem: Instantiated 53 HostGroups. [2019-03-12 08:30:58 +0100] information/ConfigItem: Instantiated 1 ApiListener. [2019-03-12 08:30:58 +0100] information/ConfigItem: Instantiated 1 GraphiteWriter. [2019-03-12 08:30:58 +0100] information/ConfigItem: Instantiated 1 CheckerComponent. [2019-03-12 08:30:58 +0100] information/ConfigItem: Instantiated 7 Zones. [2019-03-12 08:30:58 +0100] information/ConfigItem: Instantiated 1 ExternalCommandListener. [2019-03-12 08:30:58 +0100] information/ConfigItem: Instantiated 6 Endpoints. [2019-03-12 08:30:58 +0100] information/ConfigItem: Instantiated 3 ApiUsers. [2019-03-12 08:30:58 +0100] information/ConfigItem: Instantiated 12 Users. [2019-03-12 08:30:58 +0100] information/ConfigItem: Instantiated 1 IdoMysqlConnection. [2019-03-12 08:30:58 +0100] information/ConfigItem: Instantiated 258 CheckCommands. [2019-03-12 08:30:58 +0100] information/ConfigItem: Instantiated 7 ServiceGroups. [2019-03-12 08:30:58 +0100] information/ConfigItem: Instantiated 14 TimePeriods. There is no real automation going on. Windows servers get imported from our AD via Import/Sync from the Director. Anything else is added manually (though this happens rarely, as there is no big movement in out IT infrastructure). All in all I really like icinga2. It is nice/easy to set up, runs well, looks good, is highly modular/customizable, has a very good configuration interface and a great community!